Premier Inn Bradford Central01274 203900work0871 527 9307fax Budget HotelA newly built Premier Inn hotel with 118 bedrooms and a Thyme branded on site restaurant open for breakfast and dinner 7 days per week. Reception manned 24hours per day. Car parking to rear of hotel chargeable from £2.50 per 24 hour in the pay and display car park. Check in time is from 2.0pm and check out time is 12 midday. 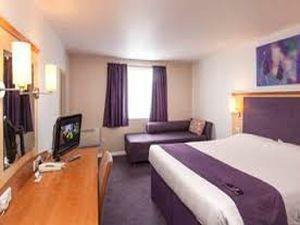 Full Premier Inn all you can eat breakfast £8.25, continental breakfast £5.25. A newly built Premier Inn hotel with 118 bedrooms and a Thyme branded on site restaurant open for breakfast and dinner 7 days per week. Reception manned 24hours per day. Next to the Leisure Exchange in Bradford City Centre, 5 minute walk in to city centre.